​No one individual will be more vested in your child's progress than you, the parent. While you may have highly, qualified professional individuals working with your child, it is important to keep in mind that most professional services are a business, so there is an inherent financial interest in retaining your child in their program. Therefore, you must assure that your child is improving and developing adequately. Consider yourself the project manager of your child's comprehensive intervention program. Once you have formulated a comprehensive intervention plan for your child, it is necessary to continually monitor and evaluate your child's progress. Children develop at varying rates and it is expected that this rate of development will vary throughout intervention across skills and across children. Therefore, it is not possible for professionals to provide clear timelines on when certain goals will be achieved or skills acquired. However, there are mechanisms to assure that your child is making progress. ​While daily reports may not be possible, a written progress report should be provided, at a minimum, on a quarterly basis. These reports should detail what progress your child has made on the targeted objectives. A meeting could be arranged between you and the professionals treating your child to discuss your child's progress and the effectiveness of the strategies being utilized. These team meetings foster productive communication between parents and professionals as well as across professional disciplines. The comprehensive intervention plan can then be revised as necessary to assure your child makes adequate progress. Data probes can be a simple method for tracking progress. If each of the targeted objectives are outlined on a simple data sheet, it can be used to track the child's progress on a regular basis and across disciplines. 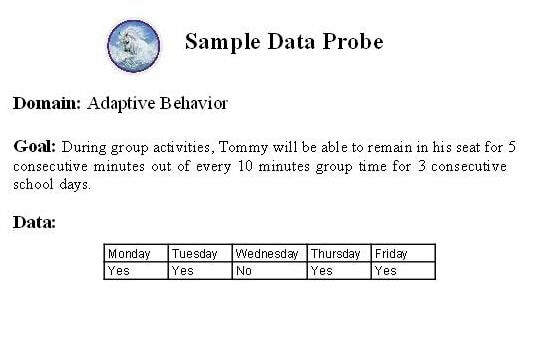 ​In this sample data probe, it is very easy to visualize Tommy's progress. So in this particular week, Tommy has not quite mastered the goal because he was unable to demonstrate this behavior on 3 consecutive days. Charts like this can be modified so that data can be collected across disciplines, in different environments, and with different individuals. ​At least once per year, this review should include the results of a readministered complete interdisciplinary evaluation. This evaluation should use the same standardized test instruments as the previous evaluation to the extent possible. This will allow for a valid comparison of scores across time. Once you have obtained the scores, you can create graphs to visually display the degree of your child's progress. ​In this sample chart, you can easily compare degrees of change across time. 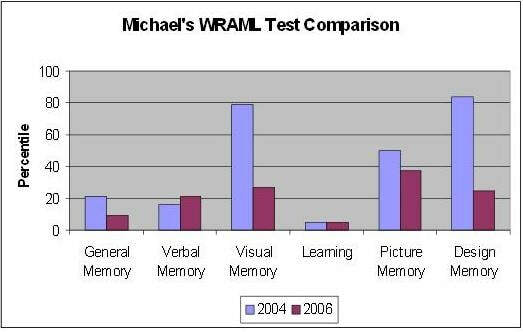 This particular chart should raise concerns in the areas of general memory, visual memory, and design memory. Therefore, intervention goals need to focus on these particular challenges.